Universal and extremely variable number plate holder in black-coated steel for motorcycles and mopeds. Ideally suitable for custom rear ends and easily adjustable adjustment angle and indicator holders up to M10 thread. 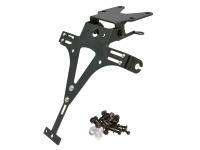 Moveable additional bracket for cable routing, for example for rear lights or number plate lighting. Screws included.